Weapons of Anew will release their debut album, “The Collision of Love and Hate” on September 15, 2017 via OK!Good Records. The quintet has announced that they will embark of a North American tour with Tesla September 18th through October 5th. Weapons of Anew, the dynamic new band that features Freddy Ordine, Ray West, Stefan “Reno” Cutrupi, Chris Manfre, and new guitarist Kris Norris will release their debut recording, “The Collision of Love and Hate” on September 15, 2017 on OK!Good Records. The quintet will then hit the road with Tesla on September 19, through October 5, 2017. 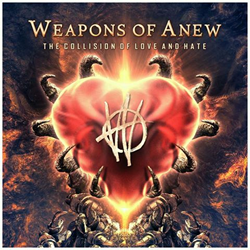 Weapons of Anew’s debut, “The Collision of Love and Hate” was produced and engineered by James F. Murphy (Havok, Necromancing The Stone, Product of Hate), mixed by Mike Ferretti (Sevendust, Warren Haynes), and mastered by Ted Jensen. Weapon of Anew’s debut single “Killshot” is available via for digital purchase on iTunes, Bandcamp and the OK!Good Shop. The track is also streaming on Spotify and SoundCloud. Weapons of Anew are set to launch their live assault.